This is quite common question among software professionals, which tool is better option for web testing. There are varieties of tools available in the market, either paid like QTP, Winrunner or some open source tools like Selenium, Webdriver. Selenium and Webdriver shares the same ancestor. We will discuss more in detail later in this blog. Now we are here to understand why we should go with selenium instead of other. I am pretty sure; gung-hos of QTP will hate me for this. But I will speak. I acquainted with selenium in 2009 July when I was searching some record and playback web form application for personal use. On top of that, it should be very small to install in term of resource usage. Many people suggested me QTP for that but there was limitation that I can use that for trial period only and secondly it consumes max resources and kind of bulky for just one simple form that I wanted to automate. After couple of hours of Google search I found Molybdenum and SeleniumIDE as an add-on for Firefox. Both are very nice, easy to install and easy to use. I tried both and was thinking to decide which one I should go with. I started learning more about both tool and found very interesting information which preluded me to decide. While Selenium IDE is focusing on developers with export to different programming languages and cross browser testing. Molybdenum is focused on simple test execution, reporting, test parameterization for everybody participating in your team. I was working on C# based in-house tool and wanted to learn some testing tools being used by other companies. I learned that in Selenium I could use my C# skills and after doing some research, I realized that Selenium/Webdriver is the future. Mercury (now HP) did great job with their tools thus their market share is ~60% in software testing. But now open source started roaring as well. Many companies are strategically moving towards cost effective test tools because Mercury(HP) tools are still an expensive option. later studies showed that we can do >70% with open source tools of what we can do via QTP so why to spend that much money if your project scope is not that much to use all features of QTP. I am going to give some high level idea which speaks about difference between Selenium and QTP. I am sure this will be very useful if you are looking to automate your web application testing. If you love OOPs programming then I would personally recommend you to go with selenium. Many testers want to do coding and this would be a perfect platform for them. 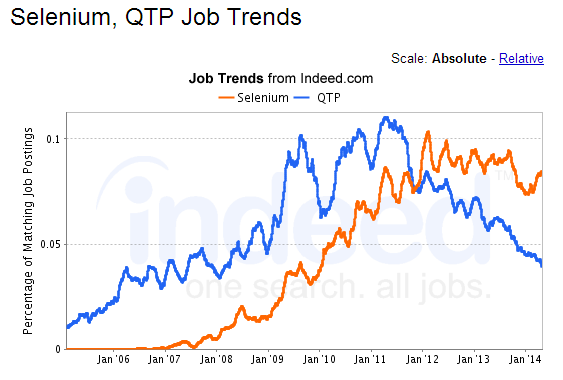 Job market is also shifting for selenium as compare to QTP. Sharing the latest job trend. Blog follower EH, raised a question that first graph may be misleading so I generated another graph QTP Testers Vs Selenium Testers. Still I noticed that QTP is going down and Selenium is moving up. Please keep visit this site as we are going to design complete test framework for web testing in .NET and Java as well. 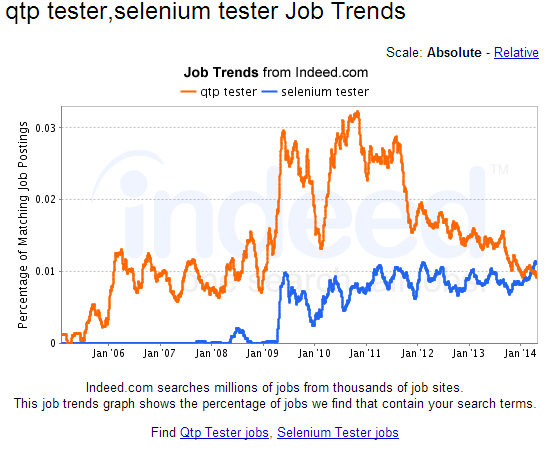 the graph is misleading – when you say selenium it includes even development jobs posted that require selenium. Whereas QTP only indicates QA automation testers only. Do a comparison of selenium testers vs QTP you will see different results. Thanks for your interesting feedback. I considered you suggestion and created another graph QTP Testers Vs Selenium Testers and graph really changed but overall noticed that trending is still the same. I am very much positive that Selenium will keep moving upward like this. I noticed more job position where companies are actually looking for Selenium specially who are looking for saving cost and specially if they are going to do automation first time. Keep posting your comments, I will be happy to improve this knowledge sharing portal. good graph on Jobs with Selenium and QTP. You could have added more for QTP, Selenium comparison here like device support, Open source, Web Application only for Selenium, etc.